Developers continue to employ novel methods to amass the tallest buildings in the city, leaving brokers and their clients to adjust to an obsession with height. While new developments are restricted to the area’s zoning laws, developers have come up with several ways to get taller buildings while still complying with the code. New developments are now cropping up with design elements such as building atop stilts, creating large mechanical rooms or including hollow structural voids that don’t count towards the building’s FAR (Floor Area ratio) or maximum square footage limits. The tallest residential building at 432 Park Avenue is one of the most visible examples of developers using design elements that help raise their height. The trend of new techniques to get higher buildings may also be spreading to the Upper West Side where the community is questioning Extell Development’s 50 West 66th Street project. 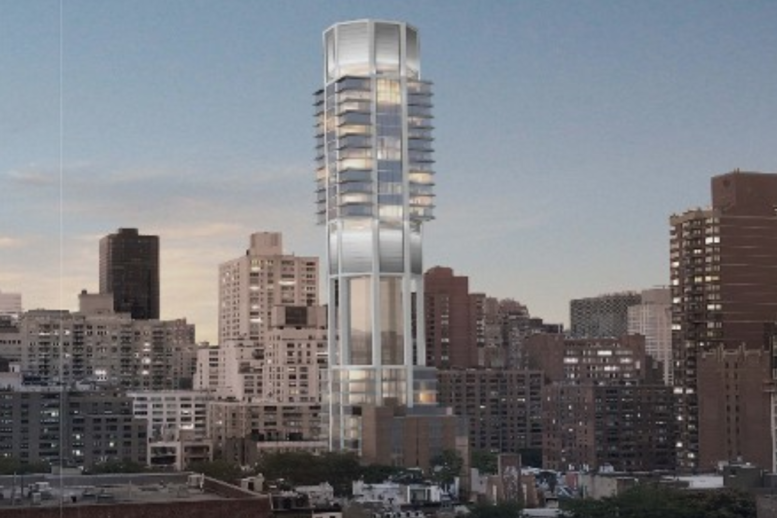 Extell’s new development would become the tallest on the Upper West Side at 775 feet high. But residents are concerned about the project, where foundation construction is already underway foundation. Opponents, including the West 65th & 66th Streets Block Association, Councilmember Helen Rosenthal and preservationist group Landmark West! have claimed that the developer may sandwich structural voids between the stacks of residential floors as its previous plans called for 25 stories. While Extell released renderings for its residential tower, plans have not yet been filed for the building. Brian McFarland, principal at CetraRuddy – which is not involved with any of the previously mentioned projects — explained that adding mechanical voids in a residential project is a simple task, but building atop stilts can be a much harder challenge architecturally. According to McFarland, sometimes architects are required to use mechanical spaces to lift buildings in cases where there are surrounding buildings that prevent a property’s lower floors from reaching light and air requirements. In other cases, such as CetraRuddy’s 45 Broad Street supertall tower, mechanical spaces are found throughout the building to bring them closer to the areas that they service, McFarland explained. And these days, McFarland said the use of different techniques to boost buildings is common as more districts now have zoning that allows developers to reach for the skies. As the trend picks up more steam, brokers and their potential clients will have to adjust to the increasing amount of high floor stock. But brokers warn that the prices climb as much as the desired floor. Taking a look at 432 Park Avenue, city records show that the top floors, from the 80th floor upwards and not including the penthouses, sell for at least $30 million. The pricetag is cut almost in half with the lower apartments around the 30th, 40th and 50th floors going for roughly $15 million. Douglas Elliman broker Tamir Shemesh said the techniques used to boost building height represent a mutually beneficial scenario for developer and tenants. Shemesh explained how the various floors of residential condos still target different groups and can still be filled. And Bateman agreed, saying there’s still a market for lower properties due to personal preference or not wanting to rely on an elevator. But the Level Group broker added that developers may be creating more supply of something that the population could eventually grow tired of. As for the city, the Department of City Planning is working on adjusting the zoning regulations in high density residential areas that lead to often unexpected results. During a June mayoral town hall meeting on the Upper West Side, the department’s Manhattan director Edith Hsu-Chen said they’re trying to better understand the issue of voids, especially the “extraneous, maybe egregious” methods that are “used just to loft the building taller.” DCP said it should have policy recommendations ready by the end of the year. If anything changes, brokers may be pleased even if their top-floor sales decline. For Bateman in particular, the idea of people living in ivory towers would remove the special intimate qualities of the city.